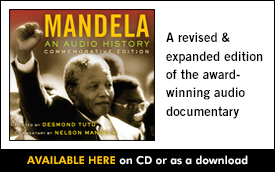 “Mandela: An Audio History” tells the story of the struggle against apartheid through rare sound recordings and the voice of Nelson Mandela himself, as well as those who fought with him, and against him. The series weaves together an unprecedented collection of archival sound: a rare recording of the 1964 trial that resulted in Mandela’s life sentence; a visit between Mandela and his family secretly taped by a prison guard; marching songs of guerilla soldiers; government propaganda films; and pirate radio broadcasts from the African National Conference (ANC). A five-part radio series documenting the struggle against apartheid. Joe Richman spent more than a year trying to get an interview with Nelson Mandela for the radio series Mandela: An Audio History. When the day finally came, it was a total surprise. Mandela was a lawyer, freedom fighter, leader of the African National Congress, and finally, president. On June 16th, 1976, in South Africa, a group of school children in the black township of Soweto held a protest and changed the course of a nation.